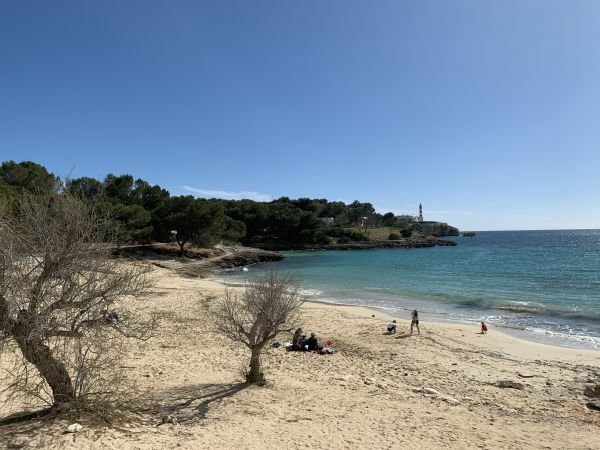 The two small beaches of Porto Colom are still an insider tip, although the restaurant Blue Bay is not only well known in this region and many customers like to dine here and to chill on the beach. The beach is perfect for everybody and the two beach bars invite to eat and to relax. Large bamboo loungers await their guests on this beach. A concrete ramp and a wooden walkway make the beach also suitable for people with reduced mobility. A beautiful beach in the southeast of Majorca. The beautiful very spacious bay is surrounded by hotels and apartments and easily accessible through an adjacent road. Above the bay you can find a lot of restaurants and small shops. The bay is very sheltered from waves and wind and therefore ideal for families with children. Beach volleyball is also possible here. The beach is 105 m wide and 145 m deep. Sun loungers and parasols as well as pedal boats can be rented here. A great bay for the whole family in the southeast of Majorca in the municipality of Felanitx. 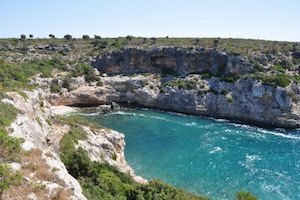 One reaches this small beach via a walk from Calas de Mallorca. First one leaves the resort Calas de Mallorca on the road in easterly direction towards the sea. After about 1000 m a turn to the left starts, with a house situated on the inside of the turn. From here a gravel path begins which you must follow. You can reach this gravel path by car also. When the path separates, you keep left and eventually get to the beautiful bay. Be careful, at the end it gets a little steeper! You can enjoy the view of the sea here in peace and quiet, as hardly anyone comes to this spot. It’s a small beach with no service and shallow waters. The Cala Clara belongs to the beach section comprising of the 4 beaches of the Cala San Vicente in the north of Majorca, close to Pollensa. The beach is surrounded by large hotels and apartment complexes. This beach offers no service and is therefore the more quiet beach. It has a shallow decline and offers clear blue water. It is ideal for snorkelling and family friendly. The bay of Cala Antena lies on the coast section of Calas de Mallorca. Situated on one side are the hotels and small houses, the other side is uninhabited. The beach is small and the decline into the sea is shallow. The beach is about 85 m long and 35 m wide. It’s more of a quiet beach and ideal for families with children. You can rent sunbeds and sunshades here and the beach also offers a beach bar and lifeguard. 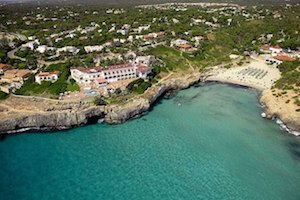 This beach section is situated on the east coast of Majorca within the community of Manacor. The Cala Tropicana. Directly at the beach you can play volleyball or hire pedal boats, as well as sunbeds and sunshades. A beach bar as well as showers and toilets are also present at the beach. The Cala Tropicana lies next to the Cala Domingo, as the beaches are merely separated by a rock ledge. You can even swim from one beach to the other through caves in the rock. The small insider’s tip of Sant Jordi. 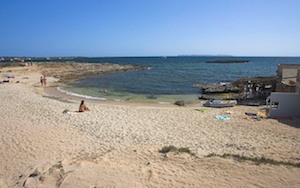 The beach without service lies next to the main beach of Colonia Sant Jordi. You can reach this beach section by foot. It is to the left of the harbour in Colonia Sant Jordi. You get to it via a path that leads directly along the water. This pretty beach has no sunbeds or sunshades to offer. Here you merely enjoy the white sand and the shallow, clear water. 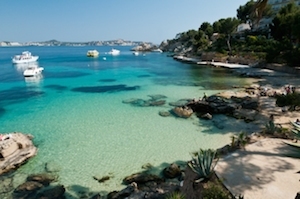 The Cala Fornells lies in the south of Majorca close to the community Calvia. The bay consists of rocky sections and some sandy sections. A small bar is situated at the beach and one can rent sunbeds and sunshades. From the left side of the beach you can see all the way to Paguera. 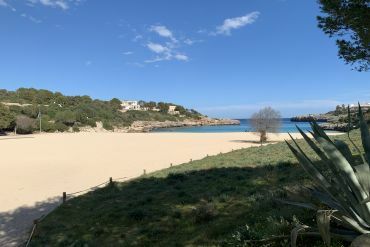 A great family friendly beach in Majorca’s south.